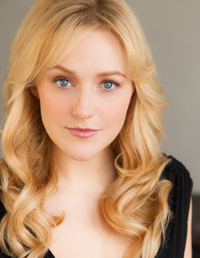 Meet Betsy Wolfe, our Mary Ann Singleton. Click here to read her official bio. Check back next week to meet another member of the cast of Armistead Maupin’s Tales of the City: A New Musical! FIRST THEATER EXPERIENCE At ten I played Kenickie in my church’s basement production of Grease, and Artful Dodger in Oliver! the following year. Apparently I played smooth-talking boys really well. FAVORITE THEATER EXPERIENCE Having the rain pour down on me at the end of Act II in 110 in the Shade. It was freeing, healing, and my first time on Broadway. HOW ARE YOU LIKE MARY ANN? Let me count the ways . . . BUT I will say I’ve never dated a child molester. FAVORITE MUSICAL Into the Woods. FAVORITE SONG TO SING “Colors of the Wind.” My two-year-old niece is obsessed with Pocahontas. And it makes me the “favorite” when I sing it! EDUCATION B.F.A. in musical theater from the University of Cincinnati’s College-Conservatory of Music (CCM). PERFORMANCE RITUAL The cucumber gimlet from Bourbon and Branch is delicious and will need to be a ritual while in San Francisco. FAVORITE ’70s WARDROBE ITEM I have no clue, but I’m sure I’ll be wearing them all during the show!